This compilation of nine short stories is a sensitive and revealing journey into the experience of being a Jew and a lesbian. Mother/daughter relationships, issues between Jewish and Gentile lovers, anti- semitism, the Holocaust, and a Shabbos dinner dyke style, complete with miso matzo ball soup—nu, what more could a reader want? 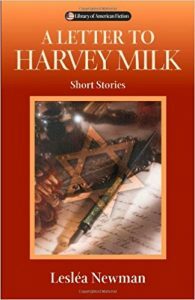 The title story, “A Letter to Harvey Milk,” was the Second Place Finalist in the 1987 Raymond Carver Short Story Competition. You had to go get yourself killed for being a faygeleh? You couldn’t let somebody else have such a great honor? Alright, alright, so you liked the boys, I wasn’t wild about the idea. But I got used to it. I never said you wasn’t welcome in my house, did I? Nu, Harvey, you couldn’t leave well enough alone? You had your own camera store, your own business, what’s bad? You couldn’t keep still about the boys, you weren’t satisfied until the whole world knew? Harvey Milk with the big ears and the big ideas, had to go make himself something, a big politician. I know, I know, I said, “Harvey, make something of yourself. Don’t be be an old shmegeggie like me, Harry the butcher.” So now I’m eating my words and they stick in my throat like an old chicken bone. It’s a rotten world, Harvey, and rottener still without you in it. You know what happened to that momser, Dan White? They let him out of jail and he goes and kills himself so nobody else should have the pleasure. Now you know me, Harvey, I’m not a violent man. In the old country, I saw things you shouldn’t know from, things you couldn’t imagine one person could do to another. But here in America, a man climbs through the window, kills the Mayor of San Francisco, kills Harvey Milk, and a couple years later he’s walking around on the street? This I never thought I’d see in my whole life. But from a country that kills the Rosenbergs, I should expect something different? cakes and the donuts, to torture me every time I go to the store to pick up a few things, I shouldn’t starve to death. Harvey, I think I’m losing my mind. You know what I do every week? Every week I go to the store, I buy a bag of jellybeans for you, you should have something to nosh on, when you come over, I remember what a sweet tooth you have. I put them in a jar on the table, in case you should come in with another crazy petition for me to sign. Sometimes I think you’re gonna walk through my door and tell me it was just another meshugeh publicity stunt. Harvey, now I’m gonna tell you something. The night you died, the whole city of San Francisco cried for you. Thirty thousand people marched in the street, I saw it on TV. Me, I didn’t go down. I’m an old man, I don’t walk so good, they said there might be riots. But no, there was no riots. Just people walking in the street, quiet, each one with a candle, until the street looked like the sky all lit up with a million stars. Old people, young people, Black people, white people, Chinese people, you name it, they was there. I remember thinking, Harvey must be so proud, and then I remembered you was dead, and such a lump rose in my throat, like a grapefruit it was, and then the tears ran down my face like rain. Can you imagine, Harvey, an old man like me, sitting alone in his apartment, crying and carrying on like a baby? But it’s the God’s truth. Never did I carry on so in all my life. And then all of a sudden I got mad. I yelled at the people on TV: for getting shot you made him into such a hero? You couldn’t march for him when he was alive, he couldn’t have a little pleasure? But nu, what good does getting mad do, it only makes my pressure go up. So I took myself a pill, calmed myself down. Then they made speeches for you, Harvey. The same people who called you a shmuck when you were alive, now you was dead, they were calling you a mensch. You were a mensch, Harvey, a mensch with a heart of gold. You were too good for this rotten world. They just weren’t ready for you.